Stores reference 27C/2057. 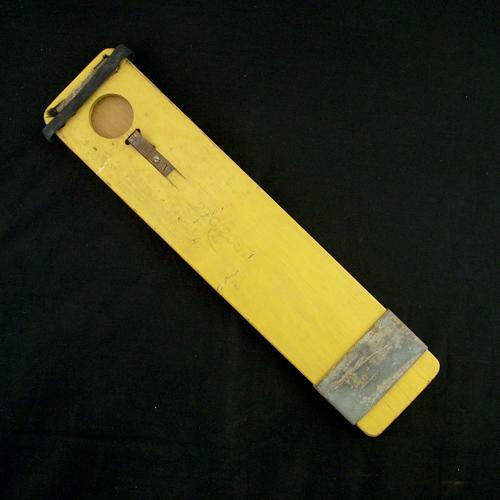 Used to hold the mast in place within the type K one-man dinghy. This consists of two pieces of plywood which slide one upon the other and can be extended so that the extreme ends fit into the thwart pockets provided on the dinghy. When fitted in such a position, two holes, one in each piece, are in line and the base of the mast can then be inserted. The wood is in good overall condition and retains most of the original yellow paint/stain. The metal componants have some corrosion but are undamaged and could be cleaned up if required. Elastic retainer bands (to hold together when packed) are stretched on one piece, absent on the other. These thwarts are often missing from dinghy packs and now extremely difficult to find. Stock code S23439.